Struggling with your mental health? Would you like to improve your fitness and feel better about yourself? There is evidence to suggest that structured exercise can be just as effective as other, more traditional methods of treating common mental health problems. It can also complement existing interventions such as anti-depressants or talking therapy. We will use physical activity, peer support and social engagement to help individuals manage their mental health and make positive changes to their lives. 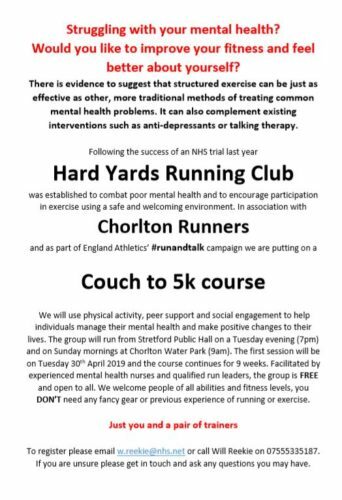 The group will run from Stretford Public Hall on a Tuesday evening (7pm) and on Sunday mornings at Chorlton Water Park (9am). The first session will be on Tuesday 30th April 2019 and the course continues for 9 weeks. 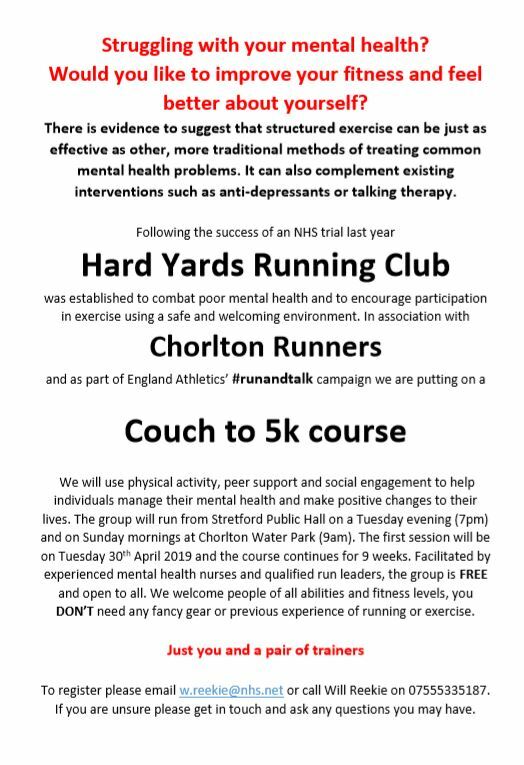 Facilitated by experienced mental health nurses and qualified run leaders, the group is FREE and open to all. We welcome people of all abilities and fitness levels, you DON’T need any fancy gear or previous experience of running or exercise. To register please email w.reekie@nhs.net or call Will Reekie on 07555335187. If you are unsure please get in touch and ask any questions you may have.